The Open Budget Survey 2006 is the inaugural edition of the International Budget Partnership’s biennial Open Budget Survey. IBP began developing the survey instrument in 2002 after a meeting of non-governmental organizations from around the world with a common interest in promoting increased public access to government budget information, strengthening public financial accountability, and opening opportunities for citizen engagement in the budget process. At the meeting, a consensus was reached about the importance and value of a global initiative to evaluate government budget transparency and the budget process by civil society organizations independent of government. The Open Budget Survey 2006 evaluated budget transparency in 59 countries using a questionnaire consisting of 122 multiple-choice questions. 91 of the questions evaluated public access to budget information and were averaged to form the inaugural Open Budget Index, which assigns countries a transparency ranking on a 100-point scale. The remaining questions covered topics related to accountable budgeting. Questionnaires were completed and peer-reviewed by independent civil society researchers. Download resources below to learn more. 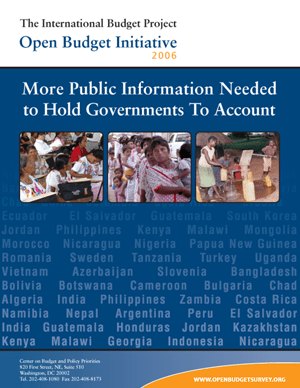 The Open Budget Survey 2006 report includes information on the Open Budget Survey research methodology, key findings from the research process, country budget transparency rankings, and more. This abbreviated report focuses on key findings from the Open Budget Survey 2006 research process. The Open Budget Index assigns countries a transparency score on a 100-point scale using questions from the Open Budget Survey. It measures a country’s overall commitment to budget transparency and allows for comparisons among countries. Learn more about the research methodology used for the Open Budget Survey 2006. The Open Budget Survey 2006 Questionnaire consisted of 122 multiple-choice questions based on generally accepted good practices related to public financial management. Independent civil society researchers and peer reviewers completing the questionnaires were asked to provide evidence for their responses. Open Budget Survey results and recommendations by country, downloads of country summaries, and completed Open Budget Survey questionnaires can be downloaded from the Open Budget Survey Results by Country main page.